Heris a gluten fre version of one of our favorite Christmas cookies (original version from a favorite cookbook “Christmas Treats & Sweets”). Using aa mixer, cream together shotening, salt and sugar until light and fluffy. Add flavor extracts and nutmeg and mix in, add eggs 1 at a time mixing between additions. Add baking powder and then add flour slowly 1 cup at a time mixing between additions. Dough will be very thick, but not crumbly. Chill or allow to rest for 1 hour.. Prepare an area to roll out cookies with psrchment, foil or wax paper sprinkled well with gf flour and well spinkled rolling pin also. (Alternately, if you want round cookies, you can hand-roll walnut sized balls of dough in colored sugars, plsce on baking sheets and gently flatten with the bottom of a glass..) Roll out about 3/8 inch thick and then cut out cookies with your fsvorite cuters. Bake at 350 F for 12 to15 minutes or so, or until the edges are just browning and cookies aresoftly2 cS set. Bake a bit longer if you like crispy cookies. Cool on pans 5 minutes before removing to a cooling rack. When completely cool, decorate as desired with ffosting and sprinkles. The daily management of meals is complicated for families with multiple food allergens. When the holidays arrive, the stresses of meal management multiply to seemingly a thousand-fold. This year our holiday meal issues will include managing for the following foods issues: 2 people who are allergic to milk and bananas, 1 person who can’t eat foods with gluten, 1 person who’s allergic to soybeans and avocados, 1 person allergic to strawberries and 1 person who’s diabetic. This traditional pair of Thanksgiving recipes is written toward persons with these food allergens and with substitution suggestions for the diabetic too. A Little Schoolhouse On the Prairie Moment (aka An After-schooling Lesson): Allow your children to help you with your holiday baking. The youngest toddlers will have fun with a bowl and wooden spoon, older toddlers and preschoolers can help w/ cookie cutter decorations and stirring. Older kids get an arithmetic lesson in measurements and fractions when they help measure and stir the ingredients together and can practice understanding temperature by setting the oven to preheat at the correct temperature. Ask your teenagers/preteens to convert temps F to C and measurements to metric system for fun or research for the family the origins of various holiday foods to share this information with the family during the meal. *if using lard, chill it in the freezer for an hour or two prior to use. *amount of flour needed will vary due to natural moisture in the flour blend and the type of “shortening” used, lard is softer and will need more flour to make a good crust, however, it’ll also make a little bit larger batch. Place flour, salt and shortening in a large mixing bowl. Cut the flour mixture into the shortening with a fork or pastry blender if doing it by hand. I prefer a more mechanical method for the sake of speed. I place these ingredients in the bowl of my Kitchen Aid stand mixer and cut the shortening into the flour using the whisk attachment. Add the vinegar and mix well (many of the gluten-free recipes I have come across in the last 2 years for baking have contained a small amount of vinegar with the explanation that it helped somehow activate the xanthan gum that is used as a binder to replace gluten??? Not sure if that’s right or not, as what I know about xanthan gum is that it activates in most liquids, but I liked that the tiny amount of vinegar gave the crust some pleasing flavor, as it was otherwise a little blah to me after using butter flavored Crisco for many years.) Add the ice water very slowly by the teaspoonful, mixing well between additions. You will find this recipe needs less liquid than your typical wheat-flour based pie crust, especially if you use lard in place of shortening. Once mixed, divide dough into 2 portions. Form into 2 discs and wrap in parchment or wax paper and chill dough for several hours in the fridge. Remove from the fridge. Line the surface on which you are rolling out your dough with parchment or waxed paper. Sprinkle the paper with tapioca flour or cornstarch. Place your disc of dough in the center of the paper and sprinkle this with tapioca or cornstarch too. Place another piece of parchment or waxed paper on top. Using your rolling pin, roll out dough into a thin sheet. Remove the top layer of paper and gently lay your pie plate on top of the dough upside-down. Carefully and gently flip the plate and dough over together. Press the dough down into the pie plate gently then cut away excess dough with a knife. Crimp or flute the edge of the pie using your favorite method. 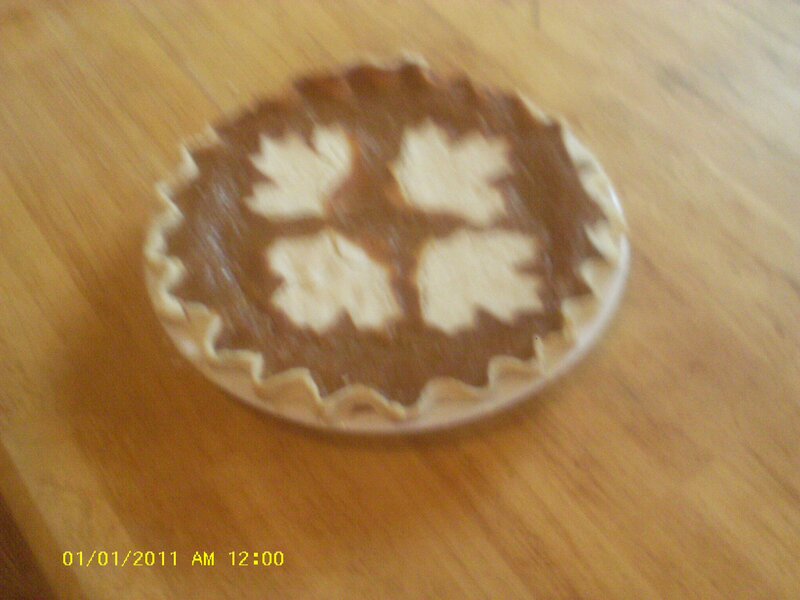 Shapes may be cut out of excess dough using cookie cutters to place on the pie after it is filled with it’s filling. Try leaves, pumpkins, acorns etc for Thanksgiving or stars, mittens, trees, reindeer etc. for Christmas. *For a 2 crust pie, repeat the dough rolling instructions for the 2nd crust after filling the pie with it’s filling, then crimp or flute and decorate. ** For a pie shell that is to be filled with a chilled filling, place the crust in the pie plate, prick crust w/fork to prevent air bubbles, then cover with foil and fill the crust with dried beans or pie weights. Bake at 350 F for 20 to 30 minutes (depending on your oven). Cool and fill with chilled filling or wrap tightly in plastic wrap and freeze for later use. In a large mixing bowl, mix sugar (or substitute) and eggs with a whisk until well blended. Add pumpkin puree and whisk until well blended. Pour in coconut milk and once again mix in very well with a whisk. Stir in spices until thoroughly mixed. Pour into your prepared pie crust. Decorate top of your pie as desired, sprinkling top of decorative crust pieces with a little granulated sugar or colored sugar sprinkles for sparkle. Bake at 350 F for approx. one hour (or maybe a little longer… you want to bake until the filling appears to have set up since this is a “custard” type pie) depending on your oven. This crust does not brown quite as much as a wheat flour based crust, so personally, I’ve been able to skip the step of covering the edge of my crust with foil and baking at 2 different temperatures. Choose pie pumpkins or small to medium sized heirloom pumpkins (the green Jaradale and the light orange and dark red-orange “Cinderella” pumpkins are among my favorites for this). Depending on your timing, you can cut the pumpkins in half, scoop out the seeds and place cut side down in a baking pan with a little water in it and bake for 30-60 minutes (depends on size of pumpkins) or until tender when pierced with a fork. Remove from oven and allow to cool. knock the stem off your pumpkin(s), wrap the whole pumpkin(s) fully in foil and heat your oven to 200 F, place wrapped pumpkin(s) on a cookie sheet(s) and place in the oven before going to bed, allow pumpkin(s) to slowly roast ovennight. Check to see they are tender first thing in the morning and remove from the oven to cool. When cool enough to handle, cut in half and scoop out the seeds. Scoop out flesh with a large metal spoon and place into a large bowl or the bowl of your food processor (this may need to be done in several batches). Mash puree by hand with a fork or potato masher or puree in a food processor. Set aside the amount needed for your pie or other recipe. Portion the rest out into 1 qt. freezer bags and freeze for later use. As a family, it seems like we’ve been discovering new territory in foodstuffs for a very long time now. It began in the summer of 2004, several months after we realized our son, Farmer Boy Charles’, allergy to cow’s milk protien at the tender age of 7 months and about a month after moving from Lubbock, TX to Liberal, KS where we purchased an 85 acre fixer-upper farm. At the time, our pediatricians (both the one in Tx and the new one in KS) encouraged us to put Charles on goat milk, taking into consideration that my nephew was extremely allergic to soy. We would not know for 4 more years he had autism, although he had exhibited some “odd” behavior to sensory stimuli even prior to birth. Shortly after we moved to KS, we purchased 2 Toggenburg milk goats, their 1 month old doe kids and an Alpine/Boer cross buck. I learned to milk and care for the goats, make butter, cheese, yogurt and ice cream and so on. The goats became beloved members of the family and when we moved again in 2005, this time from Kansas to South Dakota, shortly after the birth of our second child, Farmer Boy Henry, we brought our small herd of 9 goats with us. In 2006, we began showing the goats in the Open Class Dairy Goat Show at the SD State Fair. The herd grew, it evolved from an unregistered “grade” herd to a reistered one over the years. We lost some beloved friends in those years, but through it all, we milked and continued to learn and hone our home dairying skills. Farmer Boy Charles was diagnosed in June 2008 with Autism and Oppositional Defiance Disorder at 5 years old. At the time, he had an extremely limited diet of things he would actually eat, so we spent the next 2 1/2 years resisting the idea of removing certain foods from his diet. At this time, we were already dealing with 1 child who was allergic to cow’s milk and the other one who was mildly allergic to strawberries and also reacted to artifical food dyes and also had a life threating allergy to beestings. It was difficult to get our minds around the idea that more dietary revisions might be necessary. In the fall of 2010, Farmer Boy Charles began tipping our hand in regard to diet. He’d spent much of the previous summer eating and craving vast amounts of foods that were high in gluten (if it was made of wheat flour, he wanted to eat it… bread, pancakes, cookies, cakes, breaded pre-packaged chicken nuggets and fish sticks and so on) and drinking copious quantities of goat milk. When the school year began in August, he was suddenly limited to the portions provided by school lunch, school provided morning toast and the afternoon snack that each child brought in his or her turn for the class. We had no idea the cause at the time, all we knew was that Charles was having these aggressive, angry, violent outbursts in class and becoming dangerous to his teachers and classmates. Several teachers and his Para managed to injure themselves trying to remove him from the classroom (for the safety of hte other students) during some of these outbursts of aggression. He would kick, hit, bite, spitting, throwing books, desks and chairs. It was not only a dangerous situtation, it was also horribly disruptive to the class. More and more he was being removed from the classroom to the resource room (Special Ed Classroom). The previous year we had begun charting behavior at school thoughout the day, everyday on a chart, with notations of any changes in routine etc. and part of that charting included whatever he ate at school. We ended up having to have our annual IEP meeting a month early in order to address his behavior and offically re-assign his educational status from fully-intergrated w/ Sp Ed services in the 1st grade classroom to “self-contained” status in the resource room. In self-contained, he only got to have contact with his classmates for lunch, library, recesses and music. Being as autism is to a large degree a disability that includes significant social impairment and dysfunctional social behavior, we as parents and the school staff concurred that Charles needed to continue having some time with his classmates to learn functional social behavior such as imaginitive and cooperative play, turn taking and place appropiated group behavior such as in the library or music class. P.E. was deemed “too much stimulation” since we’d had aggression issues in gym for Charles to participate with his class and he recieved his P.E. in a 1 on 2 class with the gym teacher and his Para, from mid-Oct until the last 2 weeks of school in May. Slowly he was re-integrated into his class for P.E. It was during this IEP, listening to the teachers report on his behavior, reading through the behavioral charts of the first 6 weeks of school and the ones from Kindergarten that I started seeing a pattern of escalating behavior that was always at it’s worst an hour or two after lunch and how he had suddenly gotten so much worse behaviorally right after the school term began in the fall. I started to look for the reason WHY! What was different??? What had changed??? Was the problem which worsened after lunch somehow food related??? Having grown up with several extended family members with drug addiction issues, I quickly realized when I started researching food and autism together that my son had an addiction problem to both gluten and casein and the aggression issues we were fighting at school were just symptoms of drug withdrawl. I made my husband, Modern Pioneer Pa (aka Rob), read what I was reading about this food connection and convinced him we needed to try the Gluten-Free/Casein-Free diet with our son. Pioneer Pa finally agreed to give me 1 month, to test the theory and see if we got a reaction from Charles using the elimination diet and challenge technique. So I proceeded to find some GF/CF cookbooks at the library and begin the adventure into the New Food and Cooking Frontier! After 2 weeks on the new diet, we saw some incredible things happen. We did not tell the school what we were doing, we just started sending ALL lunch and snacks from home and told them he wasn’t allowed to have ANY school or student provided foods… home food only. Charles went into a severe withdrawl mode, complete with irritability, shakes, fevers and sweats and violently aggressive behaviors that were geared toward getting his food fix… his drug of choice. At one point, he pulled a steak knife out of the knife block and demanded Pa to make him “regular” wheat bread toast at knife point. This drove home the point to Pioneer Pa that we were indeed on the right path and that his oldest son had a severe addiction problem regarding food. To backtrack just a bit, in 2008, I had begun using our excess goat milk to craft soaps, lotions and other bath products that I was selling online and at local craft shows and farmer’s markets. Charles’ addiction to gluten and casein was so bad at this point that he could not even tolerate bathing with goat milk soap or using my insect repelling goat milk lotion/sunscreen product. We began him on the GF/CF diet the 3rd week of October 2010, and as a point of solidarity, I, Modern Ma, joined him on his diet fully (with his father and younger brother joining us in our diet for suppers and on weekends, with Pa eating his regular bread sandwiches at work and Henry having sack lunch or school lunch at school.) Shortly after going gluten-free and dairy-free with Charles, some skin and bowel related symtoms I’d been having for several years (since my pregnancy with him actually) began to clear up too. It took from October to the end of February to get Charles “clean and sober”. Along the way there were some incidences that were particularly reinforcing of the importance of this diet to extended family members… most notably my in-laws during our family trip to Colorado for Thanksgiving in Nov. 2010, just a month after we started the diet. My mother-in-law had taken my nieces and I shopping in Pueblo, Co. (The previous night I’d made a large batch (thinking the leftovers would be supper the following night) of GF/CF corndogs in the “Corndog R”… a small appliance that is similar to a waffle iron that makes corndogs…( you can find one by searching “corndog makers” on www.amazon.com, it’s probably been one of the best uses of $25 I’ve ever spent, given Charles’ preferences toward “commercial/fast food type foods”), well leaving the guys (the hubby, sons , nephew, brother-in-law and Gramps) home alone is not so smart as it turns out… they ate all the corndogs for lunch.) Us girls were kind of late getting back from our shopping trip and did not realize the corndogs for Charles’ supper were gone. My nephew, who has Asperger’s Syndrome and is also a picky eater, and my younger niece who has a tree nut allergy wanted pizza… so grandma made them pizza and used up all the cheese she’d had. Remember this was early in our going GF/CF… we were still allowing a little cheese once in a great while because Pa didn’t want Charles becoming lactose intolerant… and he was one of those dads “oh well, one meal off the diet isn’t going to hurt him”… so Pa told his mother it was okay for Charles to eat the wheat based pizza w/ his cousins. WRONG! My dear mother-in-law, finally… FINALLY (after 7 years of my trying to convince her) realized thateven mild food allergies are very very serious business. It took a granddaughter with a life-threatening allergy to nuts and a grandson who is severely addicted to the Opuim-like substances created when he eats gluten and casein to realize this and drive it home in her mind. By noon, my mother-in-law had me and my oldest niece ( who’s 13 years old, on behalf of her baby sister) out to the grocery store shopping for safe foods for the kids! In the 18 months since we started the GF/CF diet there have been charges to our family. August 2011 brought the birth of our daughter, Anna (aka the Littlest Pioneer Girl). Anna started out a breast-fed baby, however I’ve never been a good “milk cow”… indeed, had I been a dairy cow or goat, I’d have been culled long ago for poor production. After losing an entire pound after she was born, her pediatrician pretty much forced us to supplement her and threated to get the government involved if we didn’t. So we did, just to shut the doctor up. First we tried goat milk, within 36 hours she was throwing that up, then we tried the hypoallergenic formulas (avoiding soy because of my brother’s son’s severe allergy). One after another those expensive hypoallergenic formulas met with the same results (projectile vomiting after 36 hours and there after at every feeding) and continued weigh loss… finally the doctor diagnosed Anna with casein allergy (all those hypoallergenic formulas contain “caseinate” the stuff they put in non-dairy coffee creamer to make it “white”) and we resorted to soy formula to supplement. In the months since, her allergy has gotten more severe and at 5 1/2 months she could no longer tolerate my breast milk no matter how careful I was of my diet. I was so very sad of this… I was finally having a good breastfeeding experience after my dismal failures with the boys… only to have a baby who could not tolerate MY MILK. I struggle not to take the rejection of the protein in my milk personally and move on, doing what we have to to feed our kids. In the year and a half since we first began the GF/CF diet, I’ve had to learn to cook and bake all over again in new ways. We’ve accumulated some new (and somewhat uncommon) small appliances and cookbooks and Pa is contemplating growning some of our own “grain” in the family garden, particularly edamne soybeans, sorghum (milo), millet and amaranth. We’ve changed our food buying habits, away from the packaged gluten-free foods and mixes and other pre-packaged foods (which were very nice when I was relearning EVERYTHING cooking related… but rather expensive) and more toward purchase of basic ingredients we can not grow ourselves due to climate constraints such as brown and white rice that we can grind ourselves in an electric grain mill (one of said uncommon kitchen appliances) and doing more of our own cooking and baking.